Mitral valve repair is a surgical procedure used to improve the function of a stenotic (narrowed), prolapsed, or insufficient mitral valve of the heart. The mitral valve can become diseased, preventing it from adequately controlling the direction of the blood flow between the left atrium and left ventricle. It also can become insufficient (regurgitant), letting blood flow backwards into the left atrium (upper chamber) from the left ventricle (lower chamber) during ventricular contraction (systole). The mitral valve also can become stenotic (narrowed), preventing the flow of blood from the left atrium into the left ventricle during ventricular filling (diastole). In mitral valve prolapse, one or more of the mitral valve's cusps protrude back into the left atrium during ventricular contraction. Mitral valve repair is performed to improve the function of the diseased valve so that it correctly controls the direction of blood flow. Approximately 65,000 valve repairs and replacements are performed in the United States annually. Twice as many women as men are affected by mitral valve stenosis. About 60% of patients with mitral valve stenosis have had rheumatic fever. After rheumatic fever there is usually a latency period of 10–20 years before symptoms of mitral valve stenosis appear. The prevalence of mitral valve stenosis has declined in the United States because there has been a decline in the number of cases of rheumatic fever. Mitral valve stenosis may be present at birth (congenital); however, it rarely occurs alone but rather in conjunction with other heart defects. Mitral valve prolapse is the most common condition of the heart valves, and is present in about 2% of the general population. Recent studies indicate that similar numbers of men and women have mitral valve prolapse. Having this condition does not guarantee that mitral insufficiency will develop. Patients with a history of rheumatic fever, coronary artery disease, infective endocarditis, or collagen vascular disease also may develop mitral insufficiency. Cardiac monitoring is instituted and general anesthesia is provided. The surgeon uses a sternotomy to access the heart and great blood vessels. Anticoagulation is given as cannulae are inserted into the great vessels, femoral vessels, or a combination. Cardiopulmonary bypass is instituted. The heart is arrested as the cross clamp is applied to the ascending aorta to stop blood flow through the organ. The surgeon opens the heart to visualize the mitral valve. He/she may expose the mitral valve by opening the right atrium and then opening the atrial septum. Another approach requires a large left atrium that can be opened directly, making the mitral valve visible. Mitral commissurotomy is used to repair mitral stenosis associated with rheumatic disease. The commissures—openings between the valve leaflets—are manually separated by the surgeon. Fused chordae tendineae (cords of connective tissue that connect the mitral valve to the papillary muscle of the heart's left ventricle) are separated, along with papillary muscles. Calcium deposits may be removed from the valve leaflets. The left atrial appendage is removed to reduce the risk of future thromboemboli (blood clot) generation. The chordae tendineae can become lengthened or rupture, resulting in mitral valve prolapse. A skilled surgeon repairs the mitral valve structure by placing sutures in the valve leaflets to stabilize the valve structure. Typically the posterior leaflet requires this type of repair. A flexible fabric ring is sutured to the valve annulus to provide support and reconstruction for the patient's valve annulus. The size of the ring is selected to match the patient's own valve size. This repair allows the valve to function normally. The heart is closed with sutures. Deairing of the heart is performed prior to removal of the cross clamp. When the cross clamp is removed, deairing continues to ensure that no air is delivered to the systemic circulation. At this time a transesophageal echocardiogram (TEE) may be used to test that the valve is functioning correctly and that the heart is free of air. If the surgeon is not satisfied with the repair, mitral valve replacement is performed. Once the surgeon is satisfied that the valve is working correctly, cardiopulmonary bypass is terminated, anticoagulation is reversed, and the cannulae are removed from the vessels. The sternotomy is closed. Permanent stainless steel wires are used to hold the sternum bone together. The skin incision is closed with sutures, and sterile bandages are applied to the wound. Mitral valve stenosis is diagnosed by history, physical examination , listening to the sounds of the heart (cardiac auscultation), chest x ray , and ECG. Patients may have no symptoms of a valve disorder or may have shortness of breath (dyspnea), fatigue, or pulmonary edema (fluid in the lungs). Other patients present with atrial fibrillation (a cardiac arrhythmia) or an embolic event (result of a blood clot). Doppler echocardiography is the preferred diagnostic tool for evaluation of mitral valve stenosis, and can be performed in conjunction with non-invasive exercise testing by treadmill or bicycle. Cardiac catheterization is reserved for patients who demonstrate discrepancies in Doppler testing. Both left- and right-heart catheterization should be performed in the presence of elevated pulmonary artery pressures. A diagnosis of mitral insufficiency requires a detailed patient history. Listening to the heart (auscultation) reveals the presence of a third heart sound. Chest x ray and ECG provide additional information. Again, Doppler echocardiography provides valuable information. Exercise testing with Doppler echocardiography can show the true severity of the disease. After initial findings, patients may be followed with repeat visits and testing to monitor disease progress. If the patient has reached NYHA Class III or IV, replacement is considered. Severe pulmonary hypertension with pulmonary artery systolic pressures greater than 60 mm Hg is considered an indication for surgery. Left ventricular ejection fraction less than 60% also is an indication for surgery. The patient receives continued cardiac monitoring in the intensive care unit and usually remains in intensive care for 24–48 hours after surgery. Ventilation support is discontinued when the patient is able to breathe on his/her own. If mechanical circulatory support and inotropic agents (a substance that influences the force of muscle contractions, e.g. digitalis) were needed during the surgical procedure, they are discontinued as cardiac function recovers. Tubes draining blood from the chest cavity are removed as bleeding from the surgical procedure decreases. Prophylactic antibiotics are given to prevent infective endocarditis and prevent the recurrence of rheumatic carditis. If the patient recovers normally, discharge from the hospital occurs within a week of surgery. At discharge, the patient is given specific instructions about wound care and infection recognition, as well as contact information for the physician and guidelines about when a visit to the emergency room is indicated. Within three to four weeks after discharge, the patient is seen for follow-up office visit with the physician, at which time physical status will have improved for evaluation. Thereafter, asymptomatic, uncomplicated patients are seen at yearly intervals. Few limitations are placed on patient activity once recovery is complete. There are always risks associated with general anesthesia and cardiopulmonary bypass. Risks specifically associated with mitral valve repair include embolism, bleeding, or operative valvular endocarditis. When valve repair does not produce adequate results, then increased operative time is required to replace the mitral valve. If the patient's mitral valve is replaced with a mechanical valve, the patient must take an anticoagulation drug, such as Coumadin, for the rest of his/her life. An inadequately repaired valve, if left untreated, results in continued myocardial dysfunction resulting in pulmonary edema, congestive heart failure, and systemic thromboemboli generation. muscle continues to improve. Cardiac output improves and pulmonary hypertension resolves over several months after the initial decrease in left atrial pressure, pulmonary artery pressure, and pulmonary arteriolar resistance. Excellent results in terms of improved cardiac function and symptom relief also are expected for patients that undergo mitral valve repair for mitral stenosis. Operative mortality associated with mitral valve repair for stenosis is 1–3%. The prognosis for restenosis (re-narrowing) is 30% at five years and 60% at nine years; additional surgery is required in 4–7% of patients at five years. Eighty to 90% of patients whose mitral valve stenosis was repaired by commissurotomy are complication free at five years after surgery. 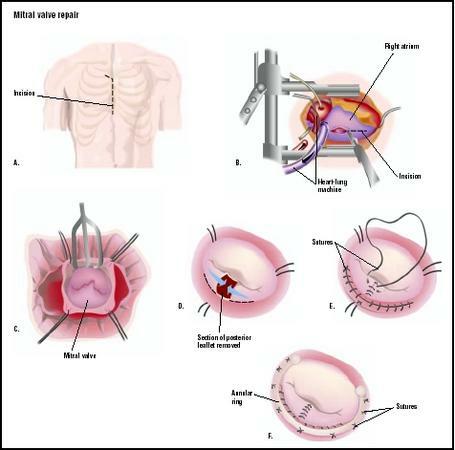 Mitral valve repair for mitral insufficiency is the preferred approach because it preserves the valvular apparatus and left ventricular function. It also eliminates the risk of mechanical valve failure and the need for lifelong anticoagulation. The asymptomatic patient with a history of rheumatic fever can be treated with prophylactic antibiotics and followed until symptoms are appear. If atrial fibrillation develops antiarrhythmic medications can be used for treatment. Atrial defibrillation may relieve atrial fibrillation. Anticoagulants may be prescribed to prevent the occurrence of systemic embolization. Mitral valve repair for mitral regurgitation is not as successful if the anterior leaflet is involved. Rheumatic, ischemic, or calcific diseases decrease the likelihood of repair in even the most skilled hands. In the absence of mitral valve replacement, mitral valve repair is indicated. Hensley, Frederick A., Donald E. Martin, and Glenn P. Gravlee, eds. A Practical Approach to Cardiac Anesthesia. 3rd ed. Philadelphia: Lippincott Williams & Wilkins, 2003. Topol, Eric J., ed. Textbook of Interventional Cardiology. Philadelphia: W. B. Saunders, 2002. Bonow, R., et al. "ACC/AHA Guidelines for the Management of Patients with Valvular Heart Disease." Journal of the American College of Cardiology 32 (November 1998): 1486–1582. Brown, Katherine Kay. "Minimally Invasive Valve Surgery" Critical Care Nursing Quarterly 20 (February 1998): 40–52. Wiegand, Debra Lynn-McHale. "Advances in Cardiac Surgery: Valve Repair" Critical Care Nurse 23 (April 2003): 72–90. Cardiothoracic and cardiovascular surgeons perform mitral valve repair. Surgeons are trained during their residency to perform these procedures, although a certain level of skill is required for perfection of the technique. Medical centers that perform cardiac surgery are able to provide mitral valve repair. Is mitral valve repair the best treatment choice for my condition? How many of these procedures has the surgeon performed in the last year? in the last five years? What is the surgeon's morbidity and mortality rate with mitral valve repair? What will happen if the repair fails? What type of follow-up care is required during the first year after surgery and throughout the rest of my life? What type of complications can be encountered both acute and chronic? I've had mitral valve surgery a metal valve was put in my heart.That was 12 weeks ago I still have chronic fatigue my doctor says everything is OK. When might I feel better? I have had my mitral valve replaced 3 times at ages 6, 9, 20. Currently, I am 54 years old and now have severe pulmonary hypertension which is being treated with Remodulin(IV). I recently had a heart catherization performed and found that I have a mitral valve stenoises. If I have the mitral valve replaced again with a mechanical one. Would this reduce my pressures in my lungs to where I would not need the Remodulin(IV) therapy? Maybe channel blockers? I just had a routine echo 11 months after successful mitral valve repair surgery. They found a spot or something on the back side of the area. I am immediately scheduled for a trans esophogal procedure Monday. They are telling me it is either an easily treatable infection or something that will need another surgery. I am petrified I will need more surgery. Any thoughts on the usual reasons, or percentages that it is usually just an infection,etc.? Thanks. My Mother died on the operating table during mitral valve repair. The doctor said that air must have gotten into her line and caused a fatal stroke. It was NonInvasive valve repair, leaflets only. I was told the surgery went fine, no one including the Dr knew she was dead for a day and a half. I am a 40 year old female just diagnosed with mitral stenosis from heart catherazation test done last week and am scheduled for open heart surgery replacement in a month and I am currently on bed rest at home, cause my heart pressure is at 60 percent and i have pulmonary hypertension and am coughing up allot of blood.I am very scared by all of this and in the past two days I have been having more chest pains and my hand goes numb. I Need to know if I should go to the emergency room or just not worry so much? When should I go to ER? Meu namorado fez operação de reparação da válvula há 4 meses atrás, agora está tendo crises, não consegue respirar por alguns minutos e o médico disse que precisa operar novamente. É normal isso acontecer? Os riscos para uma nova operação são os mesmos da primeira? Ele está desesperado, emocionalmente muito abalado. I had rhumatic fever as a child and mitral stenosis very mild and over the years symptoms disappeared and I was able to deliver two babies and lead a normal life. Recently I got a cough and colds which does not leave my body and doctor said granular fever and i was treated with various antibiotics. When I discussed this with my mum, she said you had something like this and to go and get a check up done. After an echocardiogram cardiologist found that mitral stenosis is leaky and also I got a small ASD. Now I am 54 years old and frightened to go under the knife as the cold and coughs are the only thing bothering me in my daily life and sometimes I feel tired and sleepy. Except for that I do not feel short of breadth or any difficulty in carrying out exercises and any manual work. Please advice whether I should go for surgery now or wait for some times like two years or more? as I will not like any other complicatios like blood clots and various problems after a surgery. Thank you. i have valve repair 2month already from operation but my chest still not ok.